Astro Aimer G3 has all the features of Astro Aimer Gen II and the same dimensions and appearance of Astro Aimer Gen II. In addition, new Astro Aimer G3 is dust and water resistant with redesigned internal construction and an anti-reflection coated optical glass window to optimize its outdoor applications. Now you can take your Astro Aimer anywhere, including the dewiest of star parties. It's perfect for camping, hiking and rafting. Use it in the rain, or for any emergency situation in almost any environment. Astro Aimer's green laser is perfect for pinpointing star locations as well as any other pointing needs. The two-color LED flashlight is ideal for any indoor and outdoor illumination. Its multi functions make Astro Aimer a very useful tool for astronomers, educators, hikers, campers, any outdoor goers, rescuers, CSI laser investigation tools and many others. Visually effective Class IIIa (<5mW) high output green laser at 532nm wavelength. Green laser is 20 times brighter than red laser at the same output power as perceived by human eyes. The extremely visible green laser line allows an audience in about 3 meter radius around you to clearly trace the laser line to the intended star. Our Astro Aimer G3 has a built-in feedback circuit that constantly monitors the laser output power to keep it stable. The control allows the laser to operate stably under cold or warm ambient temperatures. When the laser is turned on, a blue LED light under the laser switch glows dimly to signal you the device is on, so you will not accidentally point the laser to others or yourself (as shown above). A built-in laser activation timer (aprx. 40 to 50 seconds) allowing hands free laser aiming when mounted as a finder scope. The user can activates the laser and follow the laser beam to aim the telescope to the desired destination and gets busy viewing the object. The laser automatically turns off to save power without additional effort to turn off. There are total of 3 brightness modes. Low and intermediate modes are for map reading. High brightness mode (4,000 mcd) is for night illumination without disrupting other stargazers' dark-adapted vision. Red-light modes are activated by turning front flashlight bezel to the left. Three white LEDs provide true color and bright illumination (approx. 21,000 mcd total), the best tool for packing up, searching for lost items, identifying colored items, and field illumination. Activate the white light by turning front flashlight bezel to the right. A voltage regulated power control circuit keeps both Red and White LEDs at a constant brightness. The circuitry keeps the LEDs operating at maximum brightness until the minimum voltage cut off point (4 volt). LED brightness does not decay according to the battery drain as with other battery powered flashlights. In addition, you may turn ON either of the LED flashlights in combination with the activated green laser to pin point an illuminated object. This feature is useful especially when the object is large, which requires additional lighting for better visual confirmation. The knurled flashlight cap can be easily operated with a thick glove on a cold night. Also the distinguishable detents on each light mode help you to operate in the dark. Our time delayed laser switch frees both hands for telescope aiming without having to hold the laser ON button as with other green pointers. Please see How to Align Your Astro Aimer with Your Telescopebelow for details. 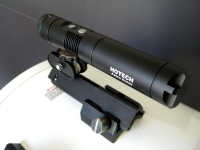 - 1" diameter fits most existing 6x30 finder scope mounts or on our TLM02-MTlaser mount. 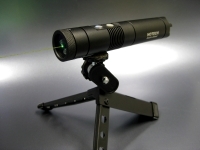 - 1 standard ¼"-20 screw hole ready for any tripod or ball mount. Our well crafted Astro Aimer is precision CNC machined from aero-space grade aluminum material, then we sand blast and anodize for a rugged and long lasting surface finish. Operated by three AAA batteries, approximately 20 continuous hours, included with the product. Package includes one detachable 15", adjustable strap to hang on your neck or wrist, a belt clip pouch, and a foam protected box for field transportation. 1" diameter x 5-3/4" length. 5.3 oz. with batteries.